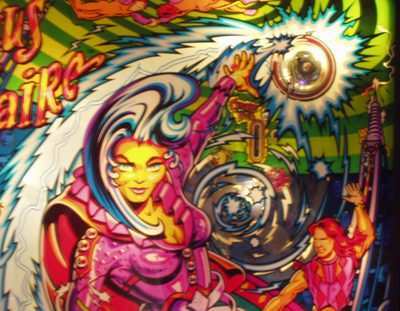 Flippers.be - Customize your Cirqus Voltaire pinball machine with a real metal bell in the backbox. This tutorial explains how to install a real metal bell in the backbox of your Cirqus Voltaire pinball machine. 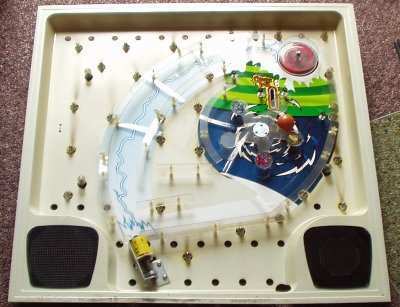 Some pinball machines go into production with less features installed than they were designed for. 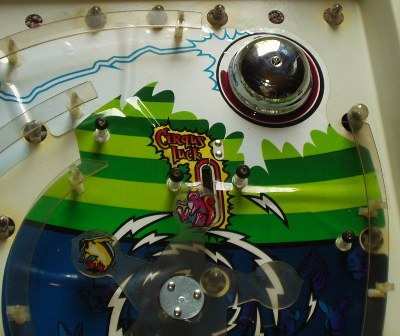 Cirqus Voltaire is one of them, the game was originally designed to have a real metal bell in the backbox, but to cut costs this feature was cancelled and a clear plastic piece was installed instead. It's not difficult to add a bell.. 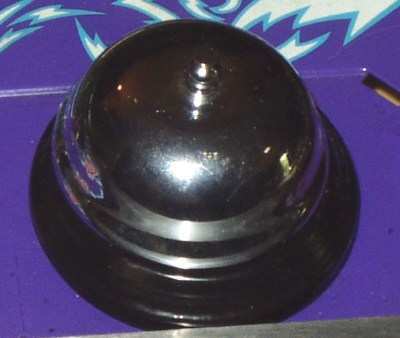 I knew about the bell before I had my Cirqus Voltaire, and the years that I have the pinball machine I always thought about installing a bell.. but it's just that you don't see this type of bell for sale often. You need to have a real 'hotel bell', a bell that sits on a desk that makes a sound when you push the button on top of it. If you've ever seen Fawlty Towers, you know what type of bell I mean. Luckily my wife is in sales/purchasing related to food products, so when I finally asked her to look for this type of bell, it only took a few days before she'd been to a wholesale store (Hanos) and bought a bell for me. In the USA you can often find these at 'dollar stores'. This bell at Amazon.com also looks like it should work for this modification. Here's the installation process described, in case you want to try it yourself too..
First, you need a metal bell.. Remove the backglass from the game. Then carefully remove the black plastic rails that keep the two parts together. Now the plastic panel is open you can clean everything, as the backbox ball usually generates a black dirt line. 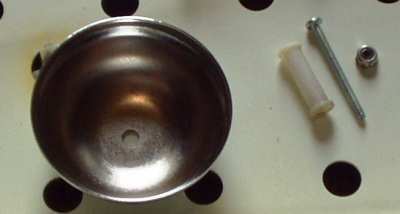 Remove the clear round part that's in place of the bell in the top right corner. The disassembled bell. As the bell is a bit larger than the plastic post on which the clear plastic was, I needed a new screw and white post. That way the bell does not touch the backpanel and makes a better sound. The metal bell installed in the backbox. I added a washer on both sides of the backbox plastic so the weight is distributed a bit..
Don't forget to clean the plastic ball and to put it back into the backbox when you put that back together ! And this is how it looks in the game. The little plastic ball has a small hole in it. You can put some solder in it to make it more heavy. The coil that kicks the ball in the air may not have enough power. Instal a new, more powerfull coil.